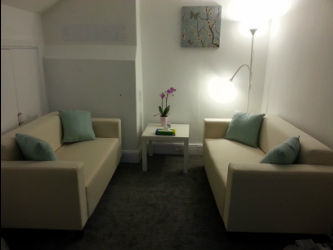 We have three rooms available for psychotherapy, assessments, trainings and workshops at our Centre in West Didsbury, one of the most popular areas in Manchester. The Centre is easily accessible from south and central Manchester. There are excellent public service connections, with the Metrolink only being 3 minutes walk away. If you are working to UKCP and its sub-organisations (such as UKATA, etc. ), BABCP, ACAT or BPS standards and are accredited by those organisations or working towards accreditation with those organisations, please feel contact us here . All rooms are furnished to a high standard and include free WiFi and refreshments. We value good team work and a good working atmosphere. Therefore we welcome professionals who are looking to work with us long-term and with the centre as their main location for private work. Many centres can have a team of up to or even more than 20 professionals. Here the focus is on having a close and trusting team. A smaller team allows for better relationships, more trust amongst colleagues if there is a need for a referral, no competition and flexibility in working hours knowing that there is always space to book a room if an appointment needs changing. We want to encourage different mental health professionals from different backgrounds and different interests and specialities to work from the centre to mirror the diversity of the community and offer the best support possible.